SACRAMENTO — Sachiko Konatsu is one of four candidates running for two seats on the Natomas Unified School District Governing Board in the Nov. 4 election. Also in the race are incumbents Teri Burns and Lisa Kaplan, and assistant civil engineer Jag Bains. “I grew up in the Central Valley, the only daughter of my father, who was interned in the Japanese concentration camps during World War II,” Konatsu said in a statement. “I was taught to treat everyone fairly regardless of their diversity. “I am now a mother of four with one child who has a disability. I have been advocating for his rights since he started kindergarten in the Natomas Unified School District eight years ago. Understanding your rights as a parent is not an easy task and it is even more difficult with a child with disabilities. In the eight years of working with this district as a parent, I have become an advocate for other parents who face the same struggles. “My work in the district includes: PTA president and vice president; School Site Council member at both elementary and secondary schools; volunteer at school sites; serves on a non-profit board; supporting school-aged kids. Endorsers include: Alex Gallardo-Rooker, vice chair of California Democratic Party; Democratic Party of Sacramento County; Ryan Herche, Natomas School Board trustee; Michael Baker, Twin Rivers School Board trustee; John Dexter, former Twin Rivers School Board trustee; Francisco Garcia, former North Sacramento School Board trustee; Warren Harding, chair of Arden Manor Park and Recreation District. 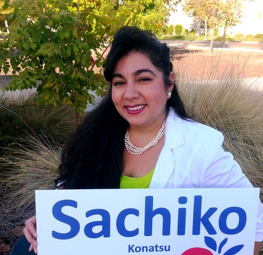 “Sachiko Konatsu is an intelligent and reasonable advocate for the needs of Natomas children. She will be an excellent trustee for Natomas schools,” said Bruce Pomer, former Los Rios Community College Board member.